Weaning Rabbits How To’s – How and when to wean, physiological versus physical weaning, and reducing the risk of stress-induced diarrhea after weaning baby bunny rabbits. Weaning is best done as a process rather than an event. As a general guideline, 5.5 - 6 weeks old is a fine age for beginning the weaning process. Thanks to natural instincts and capabilities within the genetic DNA of the rabbit, rabbit kits are fully able to feed themselves by 28 days of life (4 weeks). This coincides with the doe’s ability to bear another litter 31 days after the prior litter’s birth. In domestic rabbits, kits’ milk intake is at its maximum at around 3 weeks of age and it tapers off between 4 weeks and 7 weeks. We call this physiological weaning. Physiological weaning takes place long before physical weaning does, most of the time. We know that rabbits in the wild physically wean their litters at 4 weeks of age or slightly earlier. This is because they are already very pregnant with their next litter and they simply abandon the 4-week-old kits in order to go off and dig themselves a new burrow. In this case, physiological weaning and physical weaning are concurrent. At 4 weeks of age, all baby rabbits are more or less physiologically weaned at 4 weeks old, including our domestic rabbits, meaning they are eating and drinking on their own, and getting most or all of their sustenance by feeding themselves. A few more days, and these chinchilla Rex kits will NEED to be weaned! In modern rabbitries, however, the wise breeder has significant control over which animals breed when. 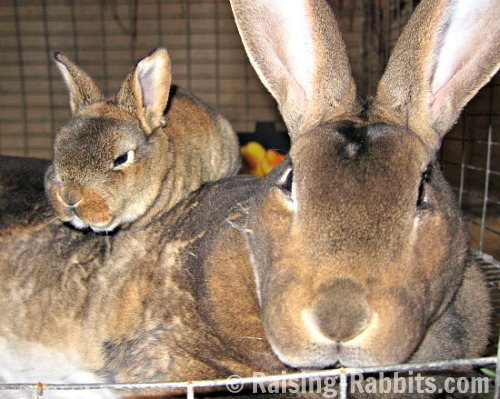 Therefore in rabbitries today, does are typically not re-bred until the prior litter has been physically weaned, or even later. Therefore, the doe may not feel the innate, physiological imperative to drive her bunnies away from her. This is why we typically see does allowing their kits to continue nursing well into week 6 or 7, if the doe is allowed to remain with her kits that long. It's not that the kits aren't physiologically weaned, it is that the doe feels magnanimous toward her kits (if one can attribute altruism to a rabbit!) and doesn't mind them snacking at the milk bar now and again. Physical Weaning: At some point between 5-7 weeks is when the dam is physically separated from the kits, resulting in actual (physical) weaning. There's no way to avoid stress at weaning entirely. Weaning causes some degree of stress. Bunnies subjected to too many stressful situations within too short a time are the bunnies most at risk for enterotoxemia - diarrhea - shortly after being weaned. STRESS is what threatens a weanling's health, not the act of weaning per se. We know that weaning is stressful on a bunny, especially if you remove the youngster from his cage, dam, and littermates all at one time and put it in its own unfamiliar cage. In some bunnies, that stress is compounded if you immediately add to all that the unfamiliar or noisy surroundings of a brand new location such as a new owner or a pet shop. We know that stress can cause or exacerbate a dangerous imbalance within the guts of bunnies whose intestinal flora is still immature (dysbiosis). If stress-induced diarrhea is going to develop, it will likely take a few days to a week to appear. We also know, however, that bunnies can die from enterotoxemia well before weaning, and in fact at any point throughout their lives. Clearly, weaning isn't a direct cause of enterotoxemia, but rather a source of stress. One other observation - if a new rabbit owner purchases a newly weaned baby rabbit, and then feeds it sugary stuff like apples and bananas and doesn't provide fiber such as grass hay, I can almost promise you a case of diarrhea. But it will have nothing to do with weaning rabbits and everything to do with too many sweets in the diet. But what if you could reduce the overall stress by weaning your bunnies in little increments over a period of several days? Bunnies can handle little stresses if the stresses occur one at a time. This 2 1/2 week old kit is unweaned. Its sibling died from enterotoxemia due to dysbiosis the day before this picture was taken. The following steps could be considered a good example of a weaning process, understanding that each rabbitry will present slightly different circumstances and utilize a slightly different protocol for their various litters. We give our kits a bit longer than 4 weeks before starting the weaning process. They might be anywhere between 5 - 7 weeks old. Remove the dam to a new cage, leaving the kits in their familiar home. This mimics Nature, where the dam simply abandons the kits to fend for themselves so she can go dig another burrow and give birth to her next litter. If necessary, send the 1-2 smallest kits with her, for two reasons. First, the small kits will get 8 teats all to themselves, providing one last shot at full bellies before being weaned. Second, their suckling will help relieve the glut of milk that may result from weaning. If the kits are already 6-7 weeks old, this will probably not be an issue as the doe will already be limiting access to the milk bar. In 1-2 days, return these kits to their littermates. Wait another day or two before making any further changes. This means that most of the kits are now 2-4 days removed from their dam. Any kits already sold could go into separate cages for a final 2-4 days. Kits remaining in the rabbitry can be separated according to gender after an additional few days. Each kit should get its own cage eventually, by 9-11 weeks of age at the latest. In this fashion, the stress from weaning rabbits is broken into 4-5 stages that stretch over a week's time or sometimes longer. When these kits go to their new homes, the move will no doubt trigger some stress, but not utter terror. 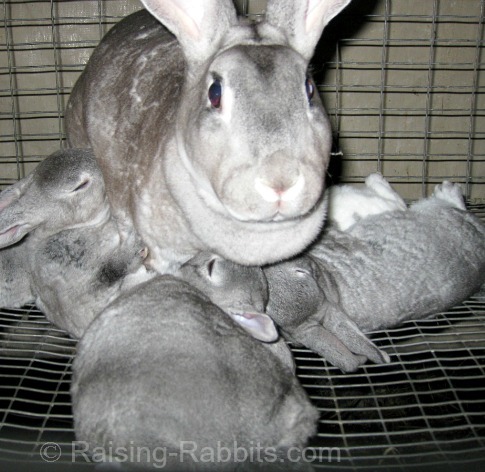 When weaning rabbits, there is no way to totally eliminate the stress to the bunnies. But by breaking the stressful season into steps, the breeder can reduce or minimize the risk of stress-induced catastrophic diarrhea.